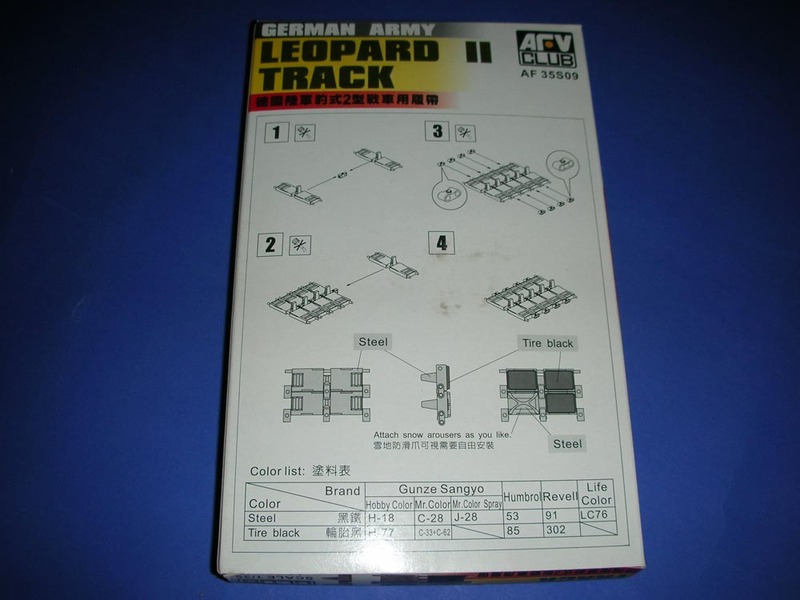 This is a guide to the most widely available PLASTIC Leopard 2 tracks. 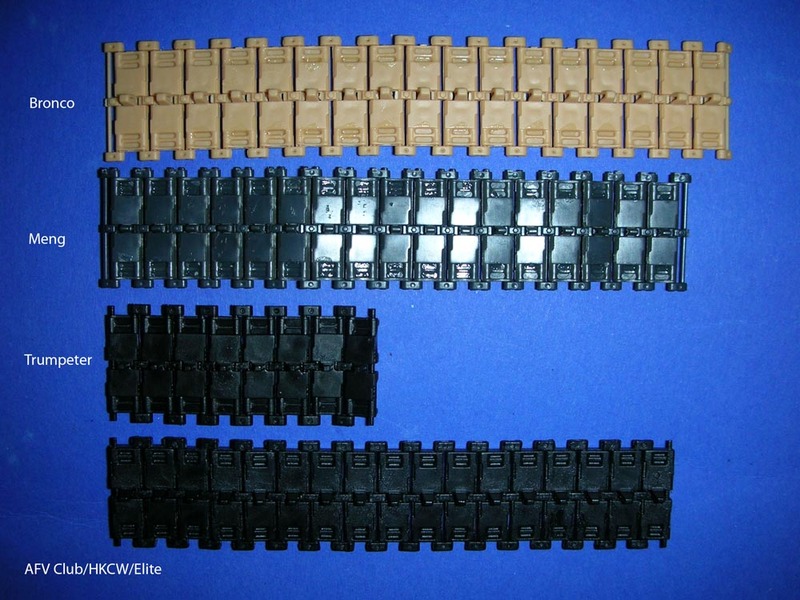 I have not compared any metal or resin tracks, so cannot give any comment about how they work. In most cases, I made each 17 links in order to compare the building process, and how they look and fit. Reference AB3528. Light sand colour. These are readily available and cheap. Building is fast and straight-forward. 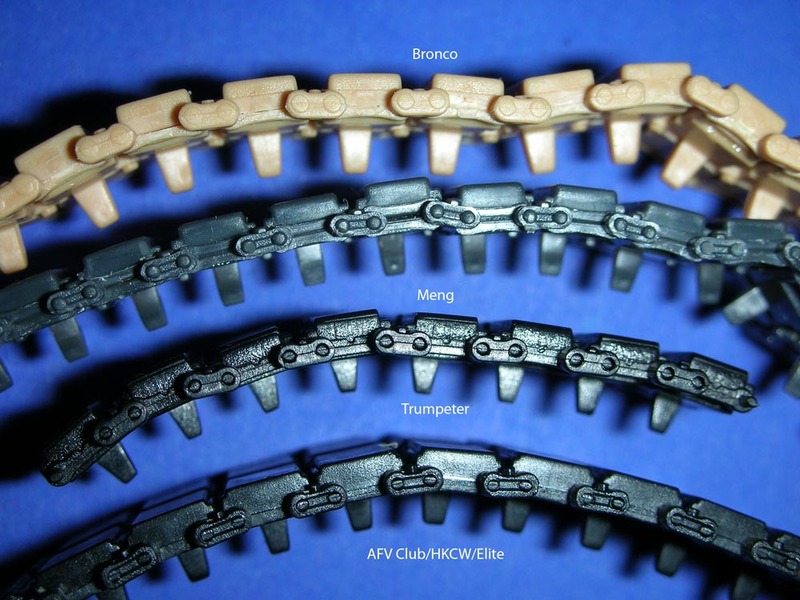 Bronco was the first manufacturer who introduced this special construction method for separate track links. 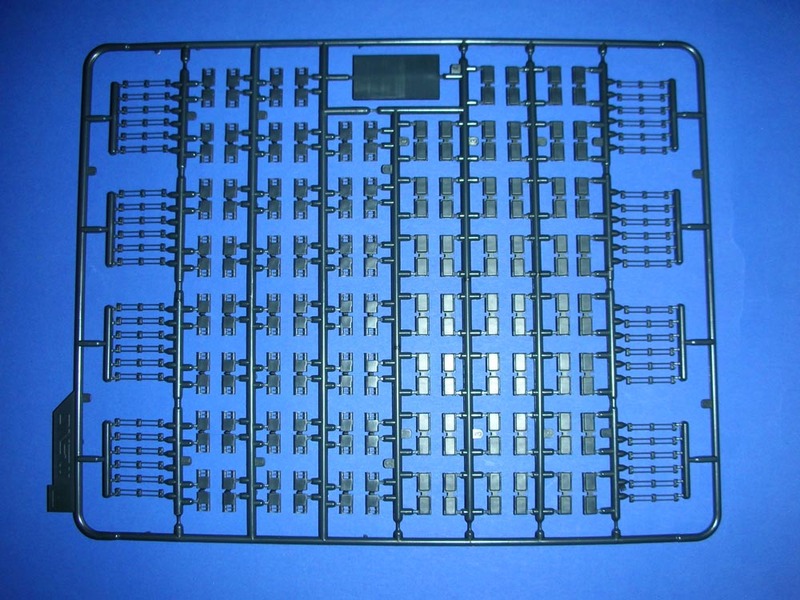 Two track pins are moulded together with the end- and mid-connectors on. 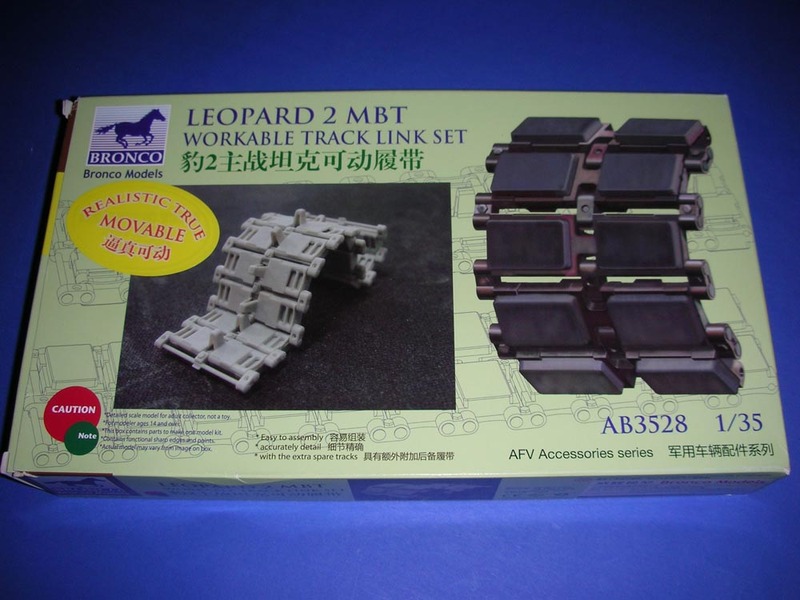 You have to add the individual track links by clicking their upper track pads to the underside of the link, which has the guiding horn attached. The detail is very fine and, as a real bonus, the guide teeth are hollow and look great. 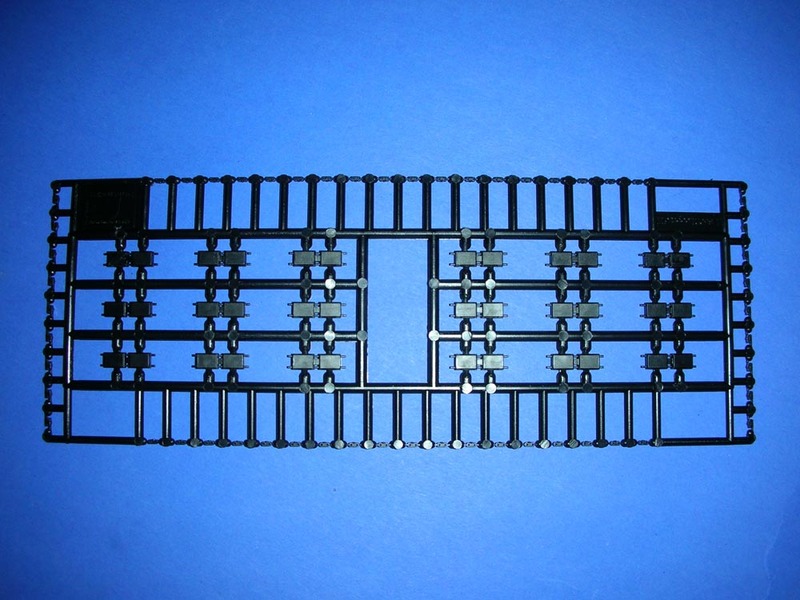 On the other hand, and due to construction of the parts, the end-connectors are missing the typical depression between the track pins. This could have been done by using slide moulds. Anyhow, overall they look pretty nice. Building is fast and straight-forward. Parts require just a quick clean-up. The material is easy to work with. Not too brittle and not too soft. If you glue carefully, the track will remain movable. Normally, you cannot make any mistakes. 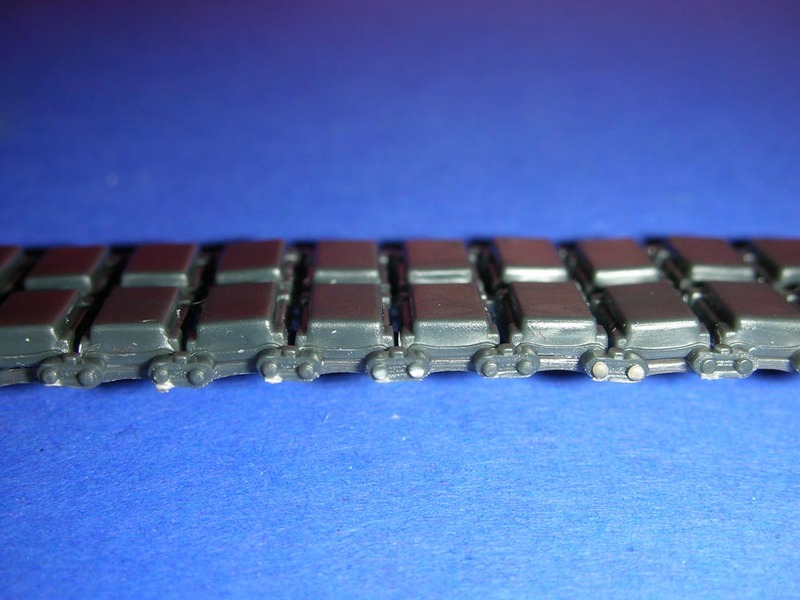 The biggest disadvantage (and easy to see on the photos) is that the length of the track links as well as the distance between the single links is too big, making the track longer than these of other manufacturers. They therefore do not fit snuggly into the drive sprockets. 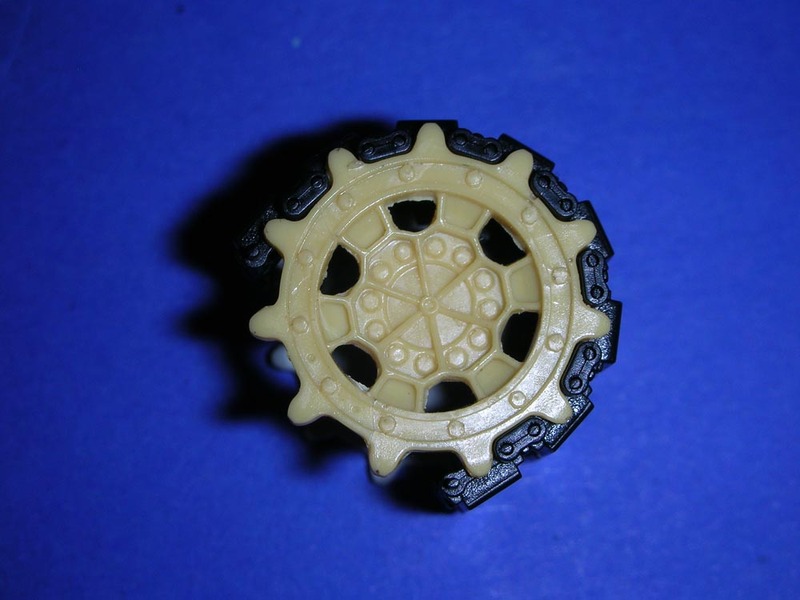 In the photos I have used a resin copy of the Tamiya sprockets from their Leopard 2A5/2A6, but the same goes for the sprockets from Revell and Meng. You may need to file down the teeth a little to ensure good fit. 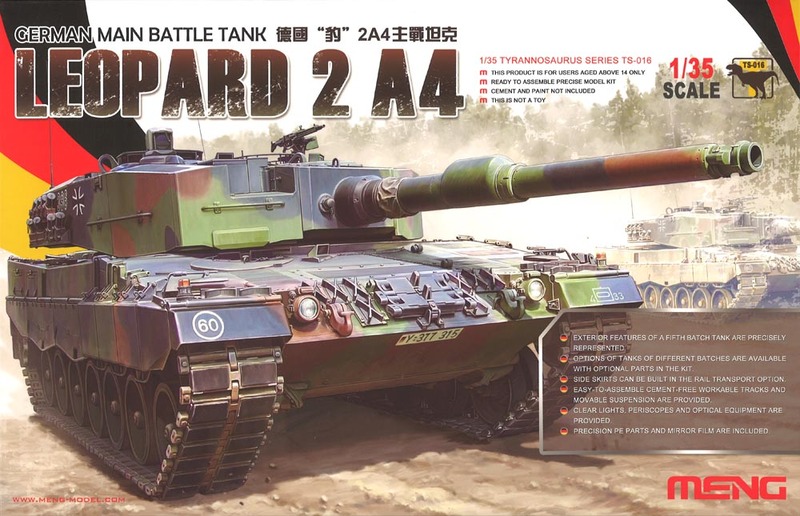 Reference TS016, included in their Leopard 2A4 kit - not available separately. Grey colour. Construction of the parts is pretty much same style like Bronco. 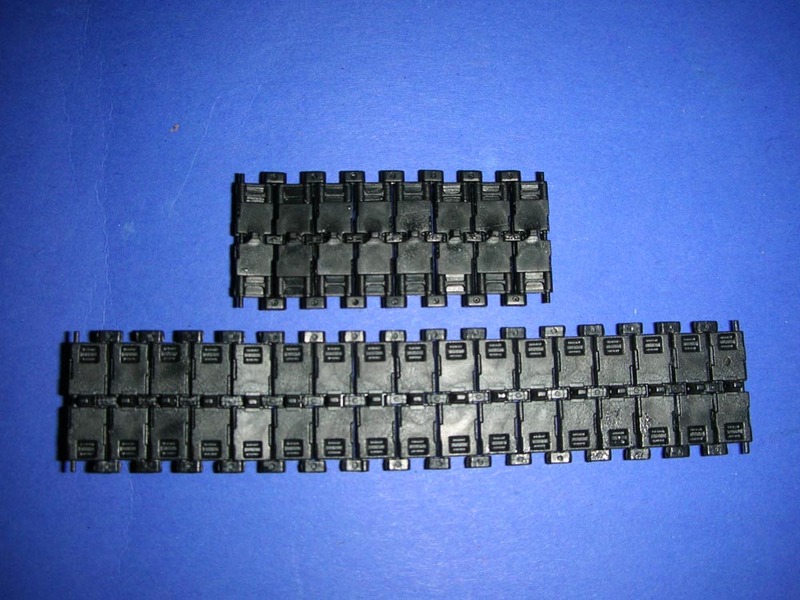 These tracks show very nice detail: track guides are hollow and the end-connectors have the typical depressions on one side (Meng used a sliding mould). 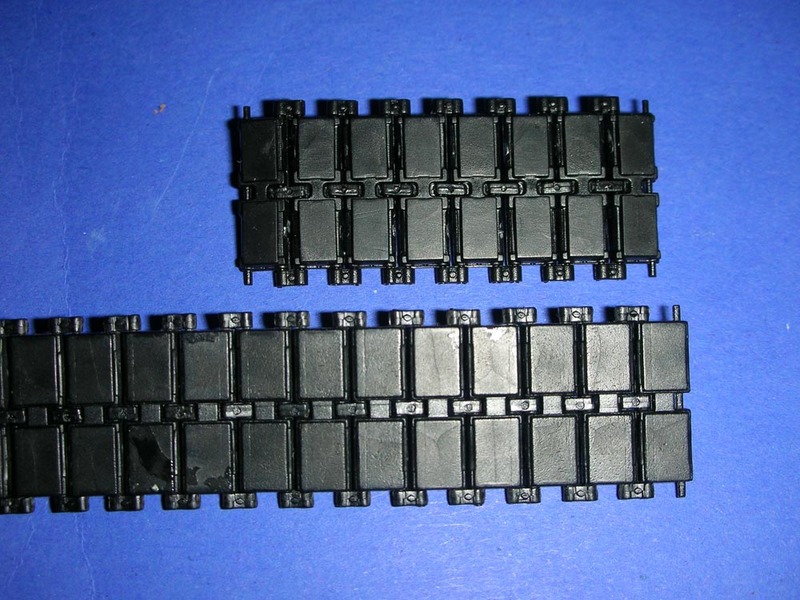 Therefore, be careful that you put the tracks with these better detailed end-connectors to the outside of your tank. What looks perfect at first glance turns out to be a their week point: you need to clean these pretty tiny parts on top and on the sides because the sprues sit somehow 'overlap' onto the parts. So be very careful not to destroy the nice details. 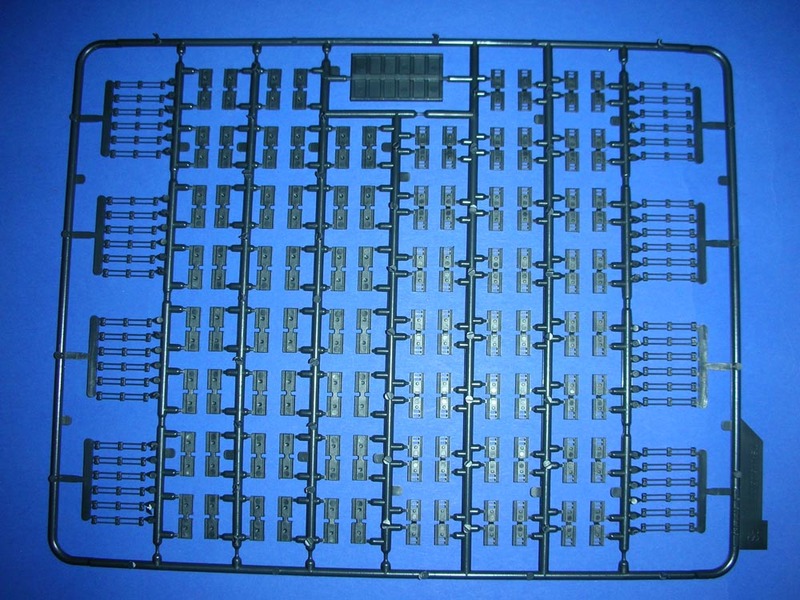 Plastic material used by Meng is very brittle and tends to damage when cutting parts from the sprues. I killed at least 4 parts. 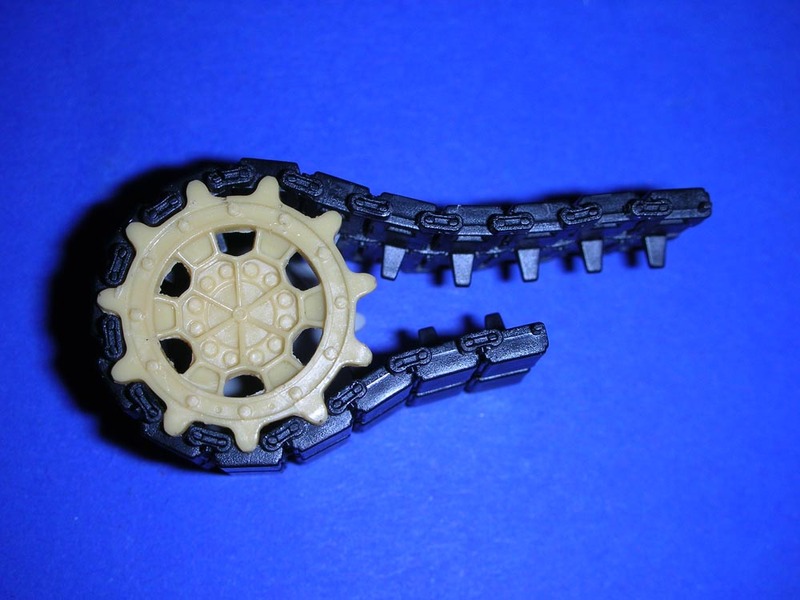 In particular, the under part of the track link tends to break at the guide horns. When your Leopard is built with side skirts on, you can hide underneath the skirts. 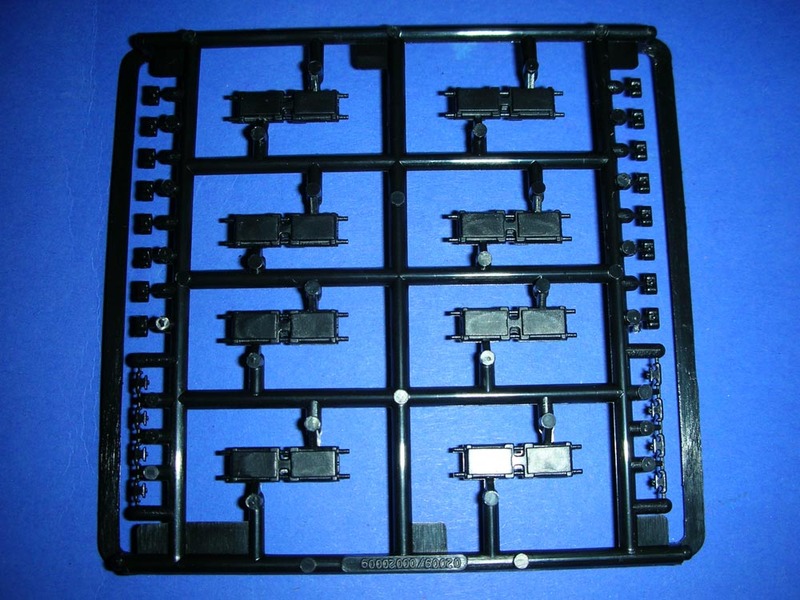 The kit includes a jig into which you place the single links to make building easy. Building is supposed to be done without glue. The parts snap together, but tend to spread out after building, so I decided to secure the links with a tiny drop of liquid cement. 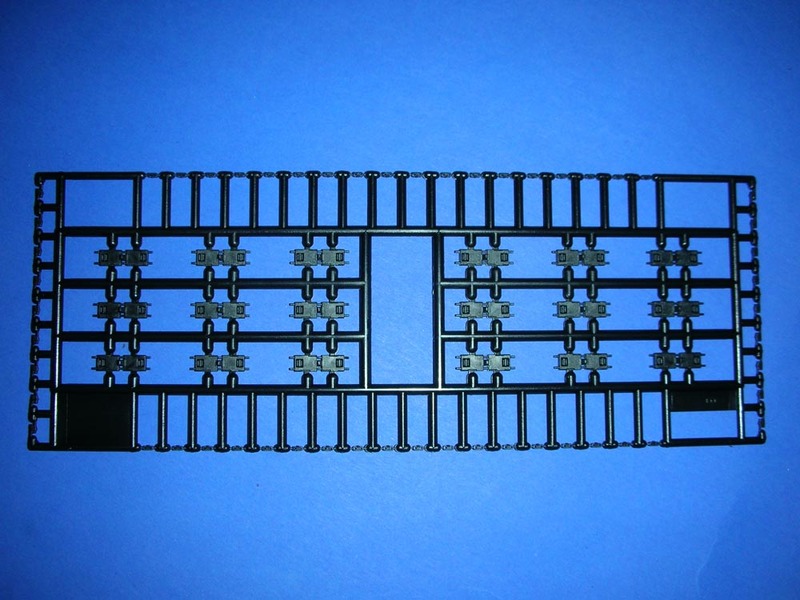 Be sure that you do not put glue where the track pins fit. 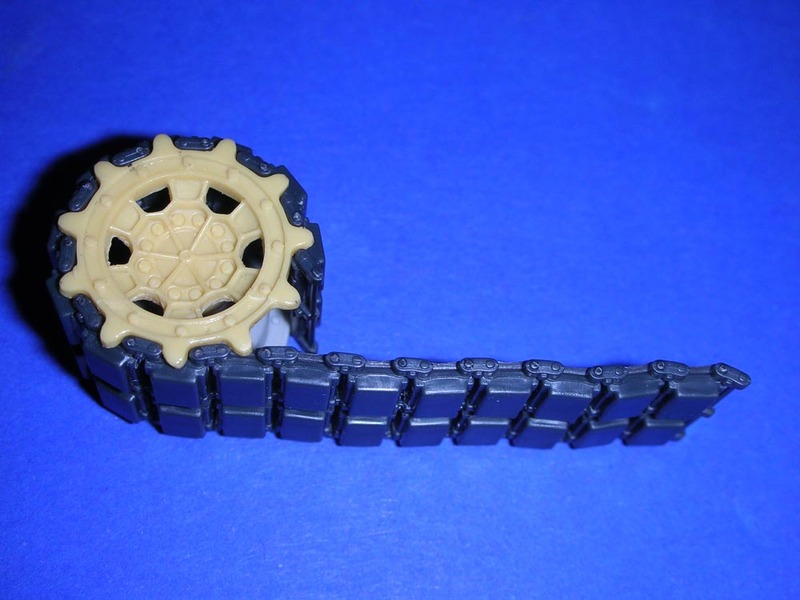 These tracks fit perfectly to the Tamiya sprocket. Reference AF35S09 and identical to Elite or HKCW (Hong Kong Creation Workshop were the original manufacturer). Black colour. They build differently to the above. 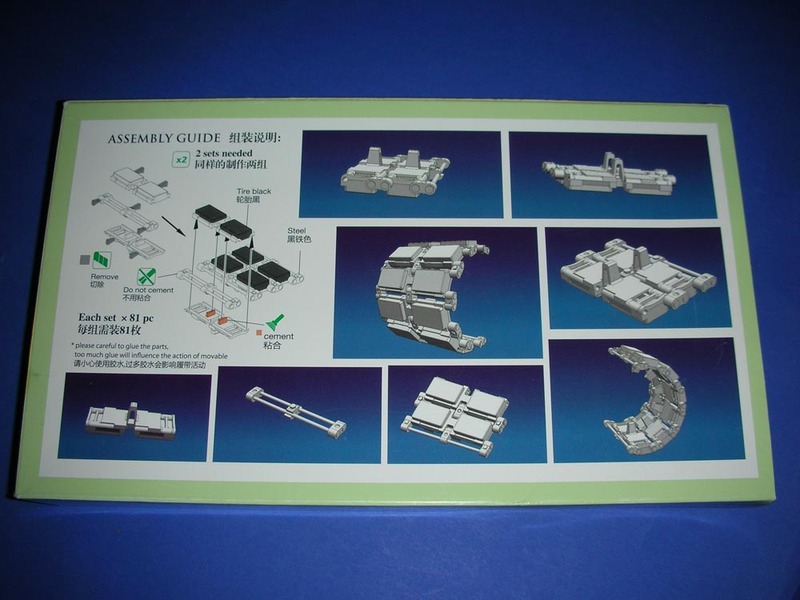 Building is very straight-forward and the parts do not require a lot of clean up. You get complete separate track links where you just have to click the mid and end-connectors without any glue. Parts are nicely detailed, but here due to construction the guiding teeth are not hollow (can hardly be seen on a built model anyhow...). The end-connectors have the tiny depression between the bolts which are typical for Leopard tracks. 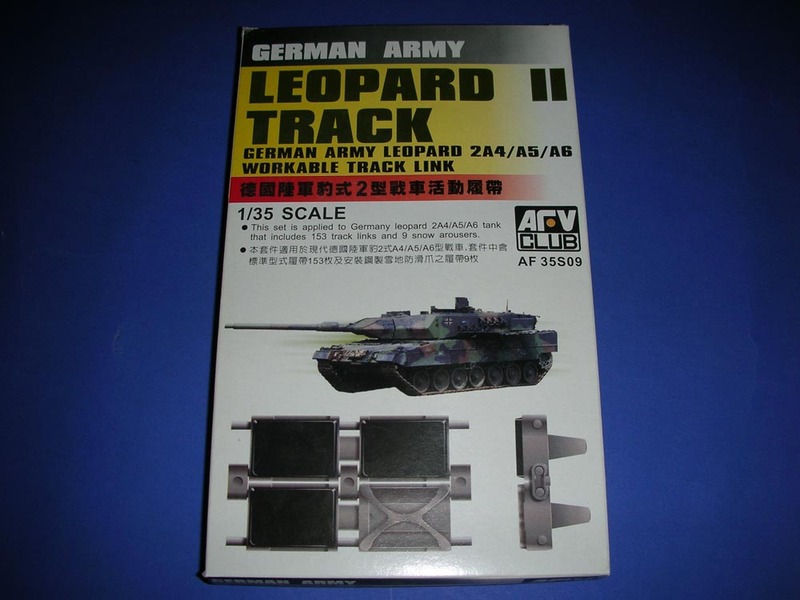 Important note: The pictures on the front of the box - as well as the instructions on the back - suggest adding the track connectors with the bolt heading to the inside of the track. This is definitely wrong. They must show to the outside of the track. 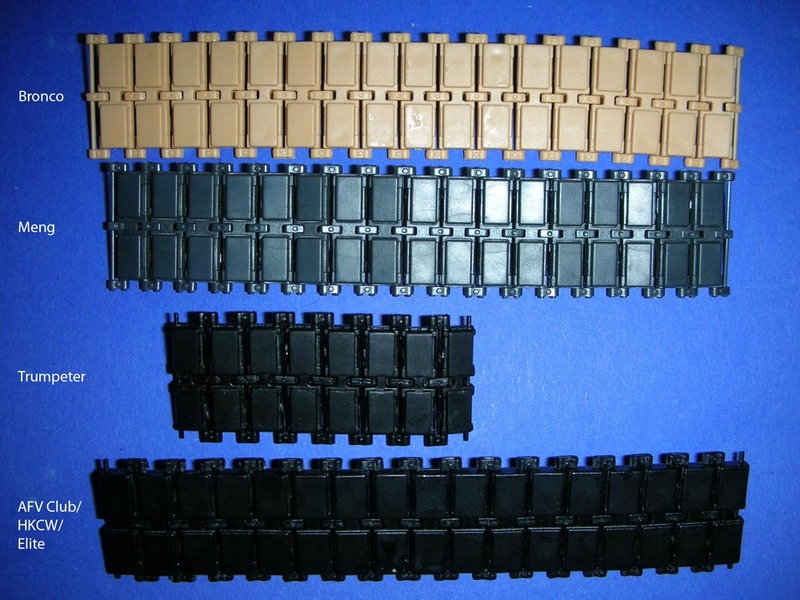 As this is just a mistake on the instructions, it is not a big deal to build the tracks correctly. Be careful and do not overlook this! In my opinion, still very good. HKCW tracks are available from the Leopard Club Shop. They fit perfectly to the Tamiya sprocket. Reference 02039. Parts also in black colour. Please excuse that I did not make a section of 17 links like the others. It does make identification in the photos easier! Building is very straight-forward. 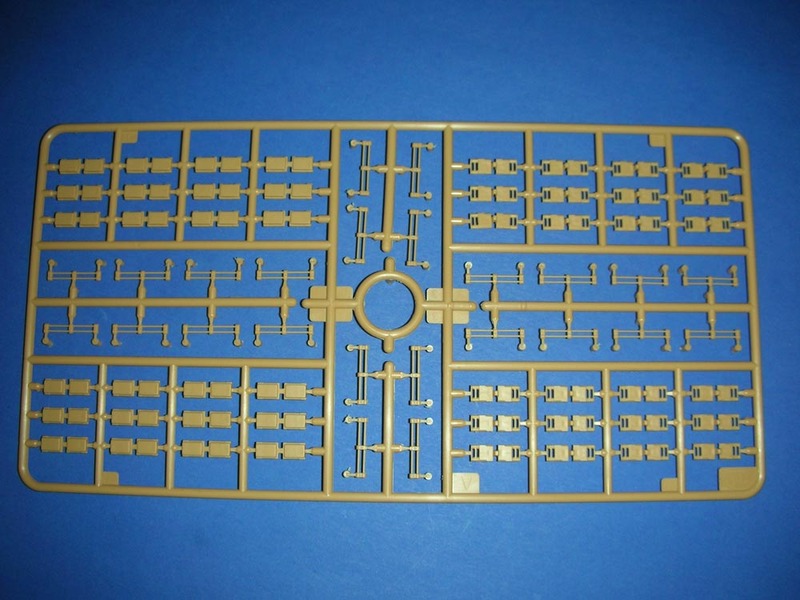 Just cut the parts from sprues, clean up a little and then connect without any glue. 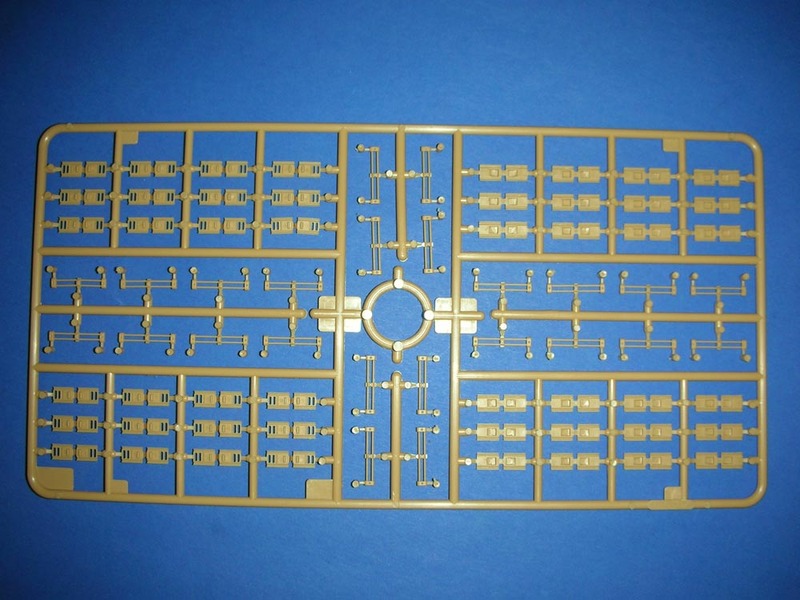 From the layout of the parts, this track is almost identical to the AFV/Elite/HKCW tracks. You get separate track links which need to be clicked together at the 'mid-connector', and then by adding the end-connectors. Clicking on the mid-connector is the only fiddly action (I broke two of them during the making of my small track section, but there are some spare parts available). Adding the end-connectors is very easy and they fit snuggly. 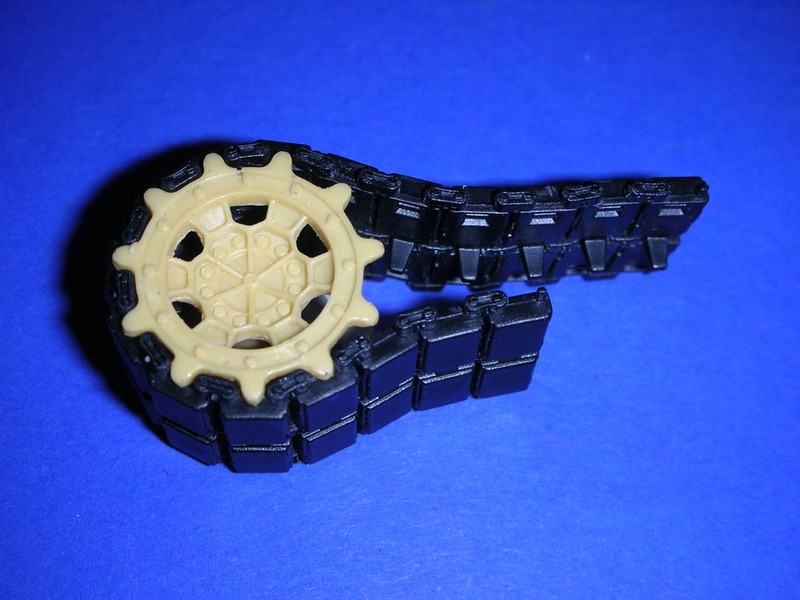 Layout of the parts is pretty smart. 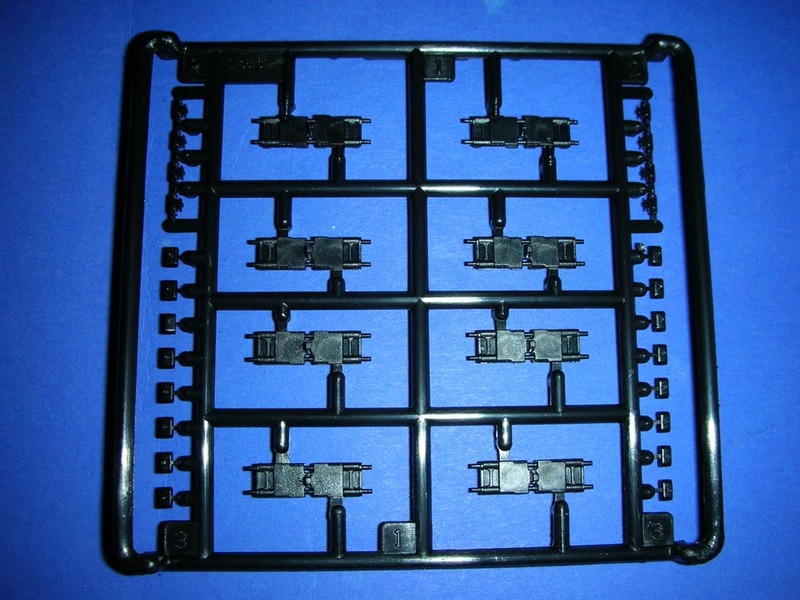 For example, the end connectors have the sprue on the inside which makes it very easy to clean them up. 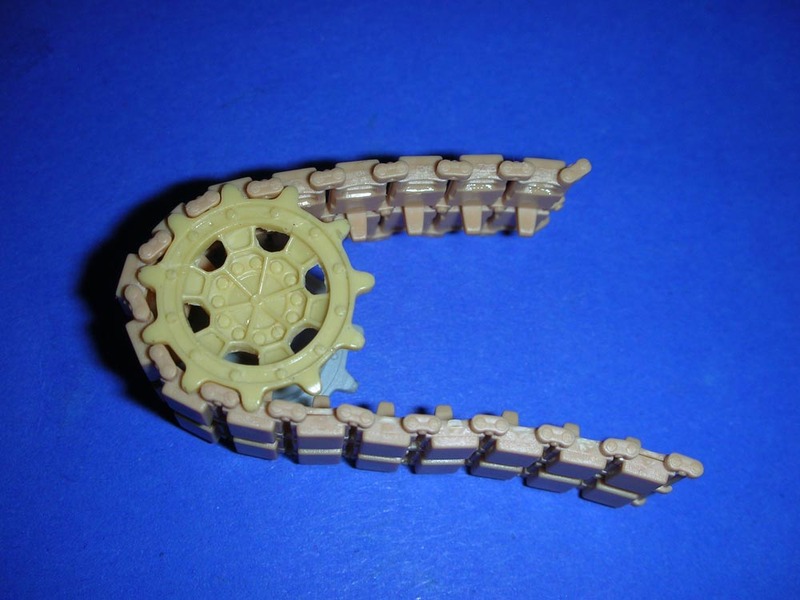 The track looks well detailed but the end connectors miss the typical depression and the guide teeth are not hollow. 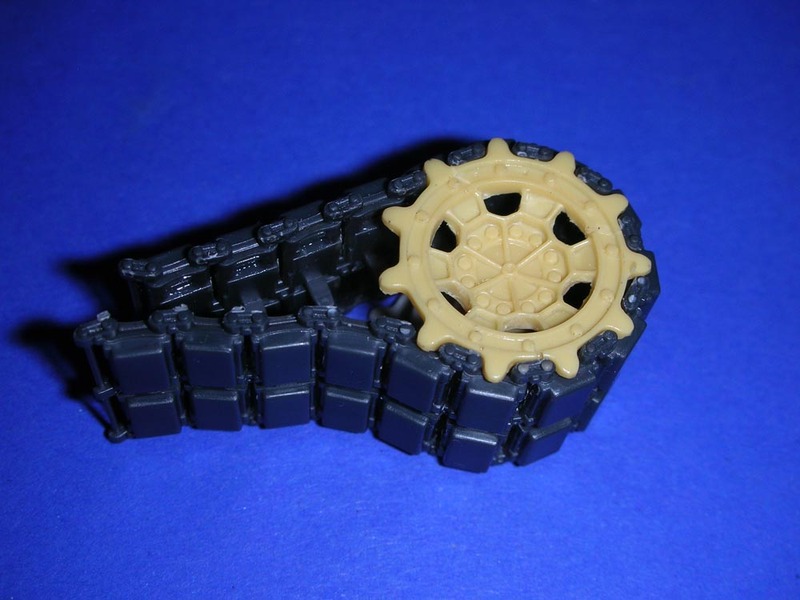 Also these tracks fit perfectly to the Tamiya sprockets. I have not used any metal tracks, so cannot give any comment how they work. It is hard to give a final verdict about which track is the best. In my personal opinion, the AFV/HKCW/Elite track is still one of the best. Look at the photos and decide yourself what is best for your model. Any one of them is better than the vinyl tracks in the kits!